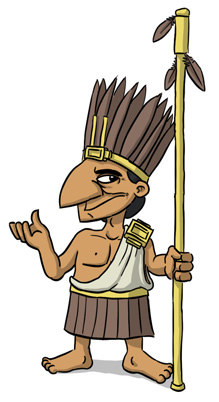 Charpek claims that he was chosen by the Gods to tell the villagers of the Mayan city of Tikal about future events. A long time ago, the ancient Mayan city of Tikal housed an Oracle that supposedly could see into the future, speak to the dead and correctly gues which card you randomly chose from a deck of cards. For a price, he’d even speak with the Gods to ask them to prevent any impending disaster that he just predicted would happen.